Hey Kitty! You met my brother Glenn on a flight a couple of months ago - he just pointed me to your blog. Being a natural blonde from birth, and one who enjoys the odd cocktail, I am totally interested in reading your books! Have either been published yet, or do you have any release dates! 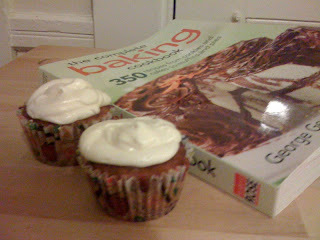 Added bonus for me...carrot cupcake recipe! Score! Hope all is well with you. As for books/release dates, no, the book hasn't been signed by a publisher yet, so now it all hangs in the balance. I hope to pitch some essays/articles on the topic in the new year and will definitely post about them here so you can check them out if I have any success! Hope you're enjoying a fabulous holiday season!